The unique character of our 2015 Petite Sirah begins with the mountain terroir of our neighbor, the historic Monte Rosso Vineyard, and its famous red soils. This distinctive fruit is characteristic of the mineral-rich, well-drained volcanic soils of Monte Rosso. The site within the vineyard where these Petite Sirah vines are planted is especially blessed; capturing cooling breezes from the San Pablo Bay which lengthen the ripening curve and preserve the acidity of the fruit. Conversely, the vineyards’ high elevation exposes the fruit to intense sunlight, ensuring consistent ripening and highly developed flavors. The vines are planted at an elevation of around 100 + feet above sea level and with an intensive dry-farming regimen that helps to deeply concentrate the characteristics of this variety. These vines yield just enough fruit for us to produce between 50 and 75 cases each year. The weather during the growing season in 2015 was dry, marking year five of draught in Northern California. We were fortunate to have had such a great harvest. The growing season began early, with a warm spring, and the weather stayed beautiful all the way through to an early September harvest. The quality of the fruit was exceptional while yields was down 30% due to ongoing drought conditions. The grapes were hand-picked on September 16, 2015. The nose on this wine opens with classic layers of red and black fruit balanced against an elegant note of minerality, trailing off into the barest hint of crushed anise seed. Swirl the glass for a moment, and you’ll uncover a subtle savory aroma of black pepper. Take a sip, and you will first notice the big, bold tannins and acidity that are so characteristic of this variety. Take a moment to let the excitement die down, and you’ll find fresh black cherries alongside floral characters reminiscent of gardenia and jasmine. The tannins will follow you through to the finish, where they’ll join in with pleasant characters of blackberry and tobacco. 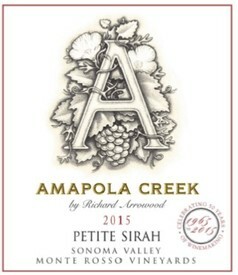 Petite Sirah of this style is a uniquely Californian tradition. As grape varieties go, it is actually a relatively new one. Developed by a French botanist by the name of Dr. Francois Durif (Petite Sirah is occasionally known as Durif, after its’ progenitor) in the 1880’s, it is the offspring of two Rhone varieties; Peloursin and Syrah.